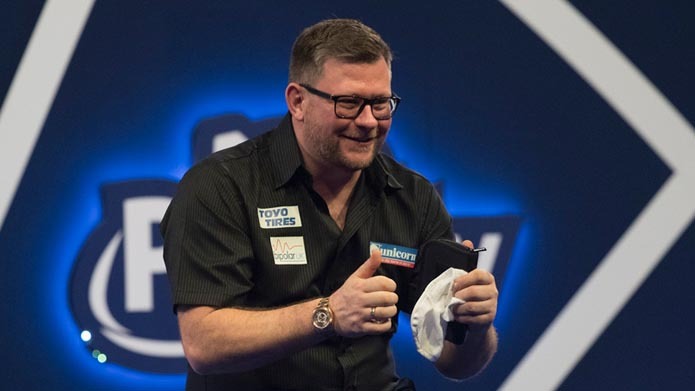 James Wade joined Gerwyn Price in winning the Players Championship double this year as he denied Jeffrey de Zwaan in the final of Players Championship 12 at the Barnsley Metrodome. Wade reigned victorious on Saturday with a 8-6 win over Michael Smith and followed that up with his third title in eight days, after coming back from 4-0 down to see off 23-year-old Jeffrey de Zwaan. The ‘Machine’ began his campaign with a narrow first round victory over Luke Woodhouse, before thrashing Christian Kist 6-0, recording a 108.7 average in the process. Wade was then embroiled in yet another last leg shoot-out, this time Ted Evetts was to be narrowly defeated. Wins over Stephen Bunting and Jonny Clayton followed for the 36-year-old as he booked his place in the semi-finals, before sealing his place in the final with yet another victory over Michael Smith – the man who he’d beaten in both of his 2019 Players Championship finals prior to Sunday evening in Barnsley. Wade secured his third Players Championship crown of the year thanks to a resurgent display in seeing off Jeffrey de Zwaan – who had averaged in excess of the 100 mark in his last three games prior to the final. De Zwaan raced out of the gates as he broke throw twice to open up a 4-0 lead, thanks to some clinical finishing, only to squander darts at the outer ring and open the door for Wade – who punished the ‘Black Cobra’ and got off the mark. Wade then reeled off the next three, including a 106 checkout, to level up proceedings at four-a-piece, before the Dutchman regained the advantage courtesy of a 13-dart leg won on the top of the board. That proved to be de Zwaan’s final straw, however, as Aldershot’s Wade tabulated the next four legs to land the Players Championship 12 title and take his weekend tally up to £20,000. Elsewhere, Ian White made his fifth consecutive Players Championship quarter-final, while Michael Barnard continued his losing streak, making it 12th successive first round defeats – a miserable run for the 2018 Challenge Tour winner. Three-time Lakeside Champion, Glen Durrant, exited in the quarter-finals, while Australia’s Corey Cadby endured defeat to Durrant in the previous round. UK Open champion, Nathan Aspinall, suffered a third round loss, as Grand Slam of Darts champion, Gerwyn Price, lost out in the fourth round in a last leg decider against Danny Noppert. Peter Wright, Adrian Lewis, Jamie Hughes and Raymond van Barneveld were all dumped out in the opening two rounds.